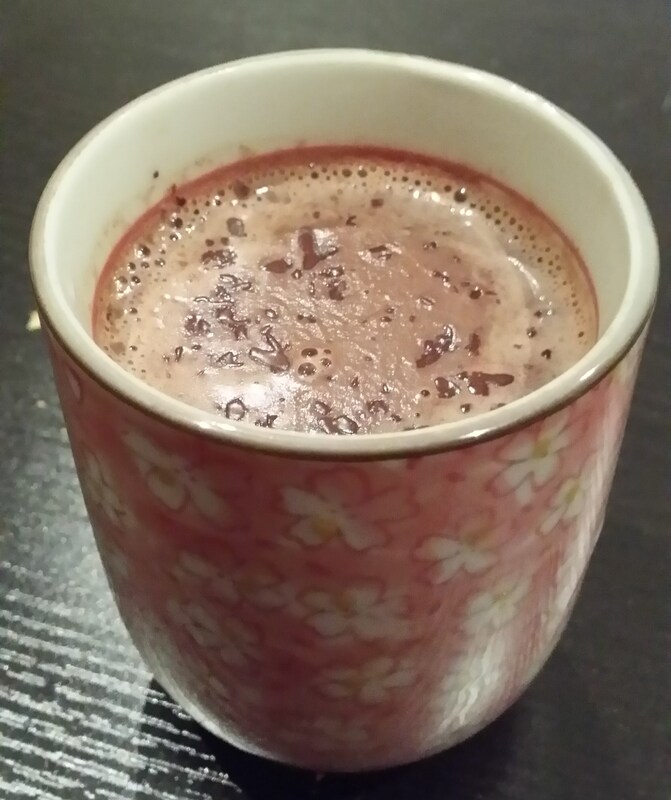 I started making this hot chocolate as a way to use up a huge block of couverture premium dark chocolate that I had lying around in the back of my fridge (don’t ask me why I had it in the first place, that’s a very long story). This hot chocolate is luscious and thick, spicy and soothing and just down right better than anything else in the world (yes you dirty mind..I know what you’re thinking…it’s even better than THAT). I serve it in tiny Japanese tea cups and this recipe is great for two portions. Honestly, even on a greedy day, it’s so rich I would struggle to drink more than a single serve. I have weighed the milk here, simply because I am too lazy to wash out a measuring cup. Add all the ingredients into a small pot and place over a low flame. Once the chocolate starts to melt, whisk well. Keep whisking, making sure the milk doesn’t catch and burn on the bottom. Once it comes to a boil, remove from heat and set aside for about 3 to 5 minutes. The hot chocolate will continue to thicken. Remove cinnamon stick. Whisk well again, before pouring into cups. Enjoy!